Does Pardot have a future? 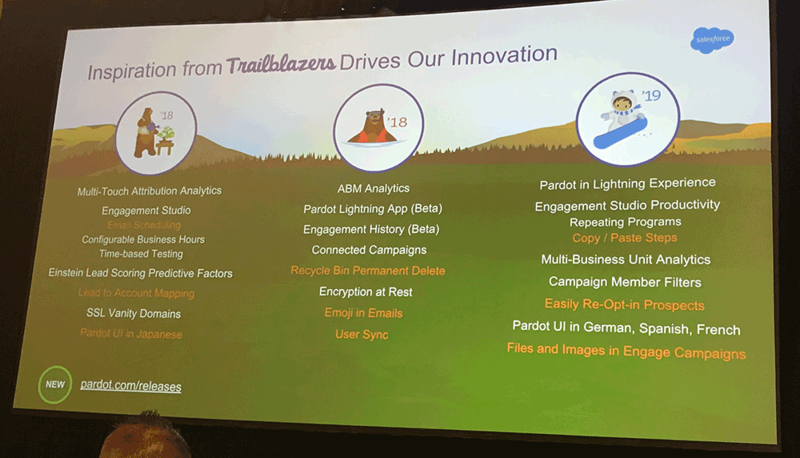 Today I have sat in the Pardot Keynote at Dreamforce #DF18. Yesterday I sat through the Pardot Roadmap. I can tell you unequivocally – Has Pardot Got a future? Engagement Studio – The ability for people to go through the same program multiple times is here. Coming soon is the ability to copy and paste elements of a journey to cut down time taken to build repeated elements as well as libraries of programs to access. Supercharge content – The move inside Sales Cloud is going to open up data on a whole new level. Access to custom objects for both segmentation and embedding in the body of emails will allow for far more advanced personalisation. Flexible composition tools will also enhance the whole email / landing page build. Think drag and drop and reusable content blocks. Business units – many organisation use pardot for different brands or products. The ability to control access along business lines is coming as well as the ability for those with the right permissions to visualise every engagement an individual is having. Assets can be shared across business units as well as analytics. Amazon recently signed the largest Pardot licence in the history of the business and are integrating it through their Amazon Business organisation. There is then a long list of others including major financial institutions, manufacturers, property groups, education providers… the list goes on. Adam Blitzer was a co-founder of Pardot. When they got acquired he chose to stay at Salesforce. He has since been promoted to head up the entire Sales Cloud business. And within that mandate is Pardot. The roadmap described above has his fingers all over it as it rapidly gets integrated into and strengthened within the Sales Cloud environment. The future for Pardot is great. Its integration with Sales Cloud is going to leave other solutions struggling as organisations strive for that one clean view of the customer and all their data. The challenge for most organisations isn’t the technology itself. The challenge is finding the time to build out the strategy, getting training and building out all the great ideas they have. That is where we help.